Following a debut onstage at WWDC 2016, Apple seeded the first beta version of iOS 10 to developers on Monday with support limited to iPhones, iPads and iPod touch models powered by the company's A6 system-on-chip and better. 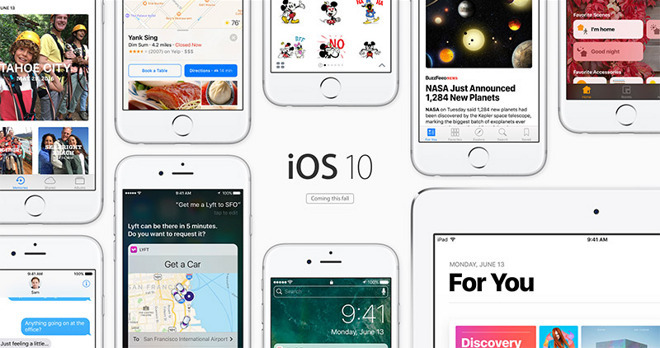 As noted at the bottom of Apple's iOS 10 preview website, the upcoming mobile operating system is compatible only with newer devices, leaving legacy models like the iPhone 4S and original iPad stuck with older iOS versions. Specifically, hardware powered by A6 chips the new minimum requirement set by iOS 10. Unlike other platforms, Apple's iOS offers reasonably deep compatibility with older hardware. However, as the mobile OS bakes in advanced features its performance standard rises, meaning legacy devices will inevitably fall short. For iOS 10, Apple has set the cutoff at the A6 SoC. The first iOS 10 beta was issued today, months ahead of public release this fall. Update: Apple on Tuesday modified the iOS 10 compatibility list, raising hardware requirements to A6 SoCs and higher.